HD is brilliant. We all know this, but like most things electronic it's tied down by, well, wires. Worry no more, as Belkin has announced the arrival of the FlyWire, a wireless HDMI device that delivers 1080p content throughout your home without the use of wires. Nice. The way the system works is by the use of a 5GHz band, a transmitter and a receiver that mounts to your HDTV. The system is said to be able to connect to devices such as Blu-ray players, videogame consoles and set-top boxes. 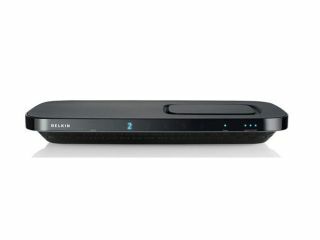 The FlyWire comes in two versions: a more expensive model (simply called FlyWire) which includes an IR channel for AV items not on show, and the ability to wirelessly sync up the whole of your home; and a cheaper version (titled FlyWire R1) that will sort your HD kit out wirelessly within one room. The FlyWire range from Belkin will land in Europe in October, although UK pricing hasn't been announced, US prices are $999.99 (£501) and $699.99 (£351) respectively.